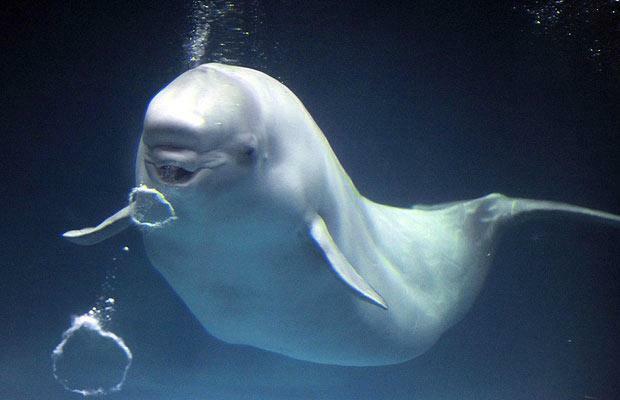 US researchers have discovered that beluga whale vocalizations were remarkably close to human speech. While dolphins have been taught to mimic the pattern and durations of sounds in human speech, no animal has spontaneously tried such mimicry. But researchers heard a nine-year-old whale named NOC make sounds octaves below normal, in clipped bursts. The researchers outline in Current Biology just how NOC did it. But the first mystery was figuring out where the sound was coming from. The whales are known as “canaries of the sea” for their high-pitched chirps, and while a number of anecdotal reports of whales making human-like speech, none had ever been recorded. When a diver at the National Marine Mammal Foundation in California surfaced saying: “Who told me to get out?” the researchers there knew they had another example on their hands. Once they identified NOC as the culprit, they made the first-ever recordings of the behavior. They found that vocal bursts averaged about three per second, with pauses reminiscent of human speech. Analysis of the recordings showed that the frequencies within them were spread out into “harmonics” in a way very unlike whales’ normal vocalizations and more like those of humans. They then rewarded NOC for the speech-like sounds to teach him to make them on command and fitted him with a pressure transducer within his nasal cavity, where sounds are produced, to monitor just what was going on. They found that he was able to rapidly change the pressure within his nasal cavity to produce the sounds. To amplify the comparatively low-frequency parts of the vocalizations, he over-inflated what is known at the vestibular sac in his blowhole – which normally acts to stop water entering the lungs. In short, the mimicry was no easy task for NOC. “Our observations suggest that the whale had to modify its vocal mechanics in order to make the speech-like sounds,” said Sam Ridgway, president of the National Marine Mammal Foundation and lead author on the paper.